Almost every week I hop on the link during my lunchbreak to check out the latest inventory of the Tacoma ReStore. Vintage Tools, Incredibly cheap hardware including TACOMA SCREW products, paint, hinges and clamps are always coming in. Let the comment thread serve as a weekly alert for items currently available. Maybe you too can join in the fun. by KevinFreitas on 6/18/2009 @ 10:55pm Sweet! Can't wait to hear what they have. Let me know some lunch you head down and I'll meet you at the 25th Street Link stop. w00t! by NineInchNachos on 6/18/2009 @ 10:57pm AS OF YESTERDAY: new home/kitchen wares retail space available. funky wood picture frames... thick wooden cutting board. toasters, VHS tapes. Special on carpet squares. 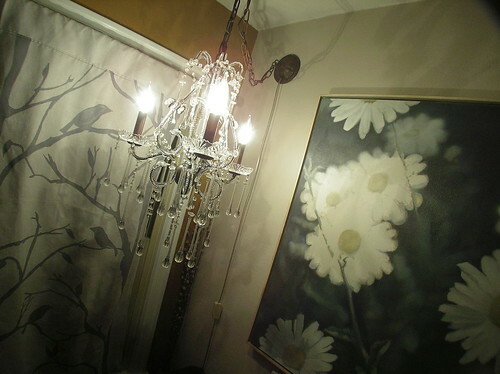 Some nice lighting fixtures. Plenty of doors. MANY clamps. MANY heavy gauge steel brackets for somekinda post system. Rope on spools. Piano Hinges. Knobs. Screw Hooks. Some nice pieces of desk furniture. by Mofo from the Hood on 6/18/2009 @ 11:27pm I'm walkin', Linkin' and walkin' down there Monday to check out the toasters. by NineInchNachos on 6/30/2009 @ 1:04pm AVAILABLE AS OF TODAY: at least 8 flexible black rain pipe extenders in stock, a very large orange carpenters level, large assortment of wall mounting hardware, new lighting fixtures, handsome roll top desk, door bell buttons, night lights, energy efficient 3 way compact bulbs. by L.S.Erhardt on 6/30/2009 @ 1:23pm METAL!. TO'T NEEDS METAL TO LIVE. TUNGSTEN!!!!!! - 1/2 Man Landscape Rock (brown), about 1 truckload worth all for $35! note: kitchen/housewares restore nextdoor was closed. by L.S.Erhardt on 8/4/2009 @ 2:35pm Need wire. Metal wire, galvanized OK, copper a plus. by beerandhotdogs on 8/4/2009 @ 3:49pm Less flexible rain pipe! I bought a piece of the corrugated pipe that accordions out to 12 feet for $2 (houses part of my soakerhose that jumps from one bed to another so I dont lose water), and 3 pieces of it that go up to 3 feet for 50� a piece to hook up my rain barrels. i heart reStore. by NineInchNachos on 8/4/2009 @ 4:02pm NOW That's handyman ingenuity sir. Excelsior! by NineInchNachos on 8/4/2009 @ 4:04pm I'm thinking about getting a rain barrel, but fear it will be empty all summer. Where is the rain!? by NineInchNachos on 8/26/2009 @ 5:42pm AS OF TODAY: carpet squares, random welding equipment parts, grinder welded to a wheel well, picture frames 20% off, massive quantity of clamps, some nice new lighting fixtures, some nice brass colored screws, sander belts. Also saw a nice fireplace bellows I should have picked up but didn't. by L.S.Erhardt on 8/26/2009 @ 6:48pm Wrong kind of wire every time I go. Looks like I need to go back to raiding dumpsters at construction sites again. by NineInchNachos on 4/13/2010 @ 1:04pm ReStore having 25% off sale whole store. Nails, Screws, Clamps, Cross-Cut Saws, knobs etc! Just walked out with bunch of light fixtures that work great as mini cold-frame green house things; small machinist's hammer; brass door knocker; 50's style cabinet door pulls. by jenyum on 4/13/2010 @ 2:06pm Did you happen to see anything that could be made into an Archimedes screw? We need the screw part for important science project purposes. by beerandhotdogs on 4/13/2010 @ 2:10pm I go weekly searching for the elusive twist doorbell. One day I shall have my reward! by Dave_L on 4/14/2010 @ 12:23am As you may also have discovered, Archimedes screw kits or diy instruction seem to always use a clear tubing wrapped as a spiral along a central core. That would be easy, though that would ruin it for me if that's the way Archimedes did it. Last summer there was a big one outdoors in one of the pools outside the Pacific Science Center that one could use. I suppose wood auger bits would work if an appropriate-sized tube, preferably clear, could be found or fabricated to go around it. The largest ones I have are only 1" dia. C@TRH, do the doorbells have to be vintage? For over a decade I've sang praises for Rejuvenation(.com) in lighting and house parts (Seattle/Portland). They have reproduction and vintage twist-type doorbells. (BTW, since I'm not a carpenter like you, I dig their double tube-latch interior locks that look like vintage mortise.) VintageHardware(.com) out of Port Townsend has a lot of stuff, including twist doorbells. But the true hunt is much more worth it. by jenyum on 4/14/2010 @ 7:48am Dave_L, yes I have tried to convince the kidlet that tubing would be just fine, but she's not having it! I kind of can't blame her it does cut down on the coolness. I have a big wide pvc pipe, a smaller pipe to go inside it, and an elbow section to work as the turn handle, and the biggest tubing I could find. But I'm still holding out for something more screw like. Someone recommended a plant auger but I guess they are used for planting bulbs and it's no longer the right season, I can't find one anywhere. Someone who's good with metal could have a nice little side business fabricating such things and selling science project kits online. @Thrice - Ah, that's why I couldn't find them on their website. Ha- Crazies like us care when they discontinue an item or finish. BTW, don't some of the fixtures in Paddy Coynes look famiiar? by KevinFreitas on 4/22/2010 @ 5:57pm Anyone know if they have a bin of 3" or so C-clamps for cheap? Looking for probably 5 or 6. Just checking but I'll also likely stop by there tomorrow to see. Cheers! by NineInchNachos on 4/22/2010 @ 8:00pm would you be ok with quick release clamps? they have a crap load. maybe a few 4' and 8' C clamps left. by NineInchNachos on 6/8/2010 @ 2:36pm lots of screwdrivers, miter saws, wrenches and socket wrench bits in the tool section. I resisted the urge to buy another handsome $1 ball-peen hammer too. by NineInchNachos on 8/12/2010 @ 1:11pm Looks like we lost a few more grandpa's-with-woodshops-in-the-garage as the ReStore is flush with new tools. Right NOW You can get an old ShopSmith lathe/drill press combo machine for a little over 100 bucks! also spotted: pipe vise, retro 'space age UFO' lamp fixtures, brass finishing nails, screw drivers! lots of em. by NineInchNachos on 8/24/2010 @ 3:25pm Great finds today! picked up a pipe cutter, rubber mallet and a few vintage light switch covers. by Crenshaw Sepulveda on 8/24/2010 @ 5:31pm I'm pretty sure the vintage light switch covers came from me. Just a reminder, if you are remodeling there are a good many items the reStore accepts. Save the trip to the dump. Last time I was there I gave them a bunch of vintage electrical fixtures. If your stuff is in good shape the reStore can probably use it. "They [Re-Store] were moving to South Tacoma Way at the end of the year unless someone wanted their Puyallup ave location before that, and was willing to buy out their lease." no more lunch time scavenger hunts! 50% OFF all windows + hardware today. - incredible supply of hand-brace bits. - ancient radial arm saw. by CassieInUP on 7/5/2011 @ 2:04pm Crum!! Why didn't I see this link and/or think of this place BEFORE Father's Day?? Well, a birthday and Christmas is still to come. Sweet!! Thanks for the share. by NineInchNachos on 9/19/2011 @ 12:36pm good lord, the ReStore is fully restocked with TACOMA SCREW surplus. I've never seen such quality, local made screws in one place! if you need standard galvanized wood screws or the fancy self-tapping square head screws check out the ReStore! other items that may interest folks - Tile sale, new shipment of large bolts, nice collection of hand saws. clamps and handbrace drill bits all gone. by NineInchNachos on 1/15/2012 @ 8:57pm ReStore is having a all out moving clearance sale! Picked up this for our new reading light. Cheap! all trim 75% off... You can get some nice wood for pennies! Make frames, display boxes... awesome! by NineInchNachos on 2/21/2012 @ 12:08pm UPDATE! 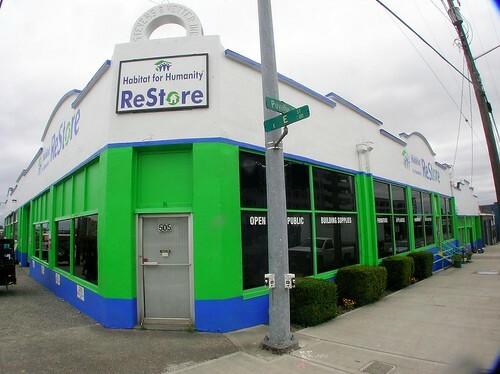 The Habitat for Humanity Store, Tacoma/Pierce County at 505 Puyallup Ave. will be closing tomorrow at 3PM. The Store will open at 4824 South Tacoma Way at 10PM on March 2nd. by KevinFreitas on 2/21/2012 @ 2:57pm Boo! Thx for the update though they will be missed downtown. by Maria on 2/21/2012 @ 4:27pm Thanks for the update, Ryan. I was watching the construction and wondering if they were opening a satellite warehouse. Hmm, was it the cost of rent, or the opportunity for a bigger building/more parking? Maybe easier access for people throughout the county? BTW, did anyone see this article about the Asia Pacific Cultural Center also moving into that neighborhood (almost across the street)? They're renting the South Park community center.